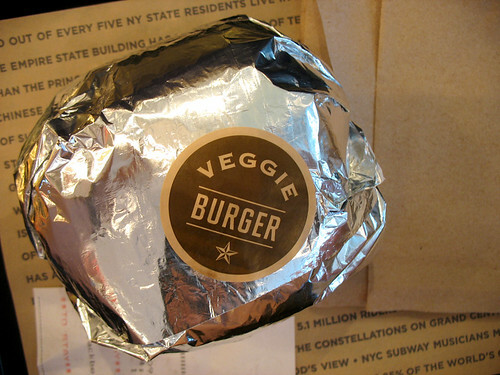 Yum Veggie Burger: New York Burger Co. The best part about being a vegetarian in NYC is that you can be out running errands pretty much anywhere in the city, and if you are starving and need to grab a bite to eat, you never have to look very far for a vegetarian option. 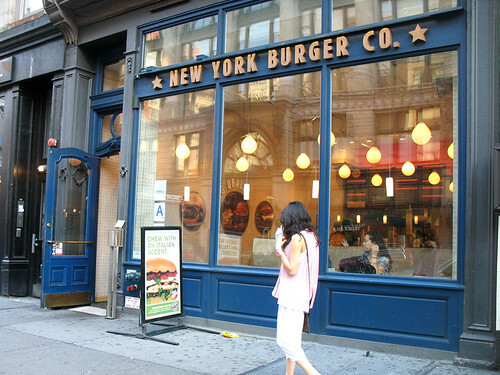 I had walked past New York Burger Co. for years before I finally had the time and appetite to stop for a late lunch here one afternoon. I ordered the “vegetarian black bean burger” – I asked if it was vegan, and the cashier went and asked the cooks, who apparently said that both the patty and the bun are vegan, although I am not 100% sure that they understood my question or were entirely sure of the answer themselves… I sometimes get the feeling that people are just saying what they think you want to hear, when you ask questions like this. The cashier mentioned that a lot of people ask if it’s vegan (I refrained from asking her why she didn’t already know the answer to the question, if it’s one she gets asked so often!). Look at that awesome sticker! I saved it and put it on my bulletin board at home. 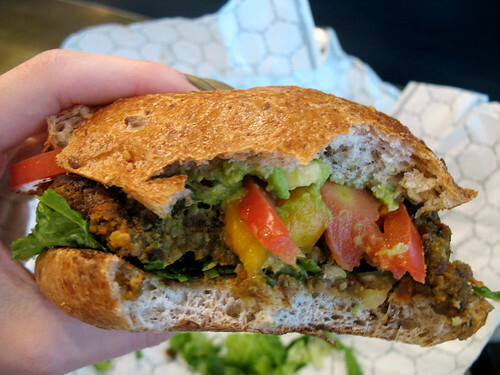 I wish all veggie burgers came with one! This burger was massive – the wheat bun was like a giant flying saucer! It was a bit too large for the rest of the burger, although it did do a good job of holding everything together as I ate it. And it tasted nice. The patty seemed definitely homemade, which surprised me. I could definitely taste the black beans, but there were other flavors too – grains and carrots, and a little spice. 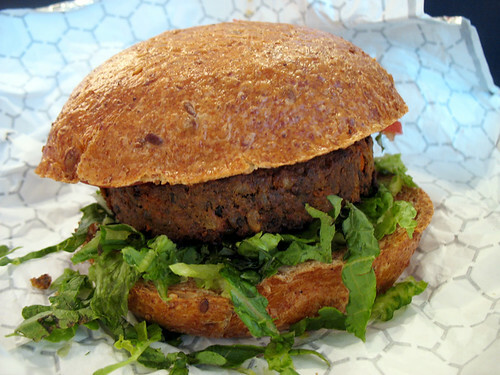 It wasn’t as heavily “bean-y” as most patties that are billed as “black bean burgers”. The toppings it came with were mango salsa, avocado, plum tomatoes, and romaine lettuce. I thought they skimped a little on the salsa, but what I tasted of it was delicious. A nice unique flavor on a burger – good for summer. 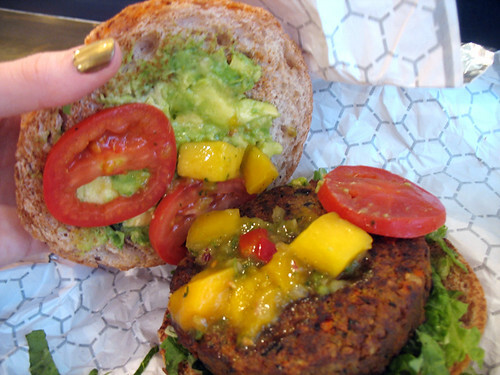 I would definitely eat it again (maybe I should try mango salsa on my burgers at home too). I was more impressed than I had expected to be by this place – I was anticipating a very average burger, probably a pre-made generic patty. There are so many burger joints in NYC, and so many of them DO cop-out and serve something mediocre as the veggie burger option. But once in awhile, you find a gem like this place that pleasantly surprises you. And kudos to any restaurant that comes up with creative toppings for a veggie burger that do not include cheese! My kinda-allergic-to-dairy body salutes you. Great sticker indeed! And you're right; whenever I ask if something is leather I'm always told, "yeeees?" because they are trying to gauge my preferred response and assume it's yes. UGH. No shame in saying "I don't know." Even better if you can say, "But, I'll find out"! This place is right across the street from where I work and I've never thought to go there for a veggie burger. I might have to swing by just for the sticker alone.